2018 is on pace to show the highest growth in the US economy since the Great Recession ended in 2009. Housing starts reached a 10 year high in November and a recent survey showed that confidence among home builders is at an 18-1/2 year high. The US economy is soaring and confidence continues to grow. Now is the time to invest in technology that will increase your efficiency and throughput so you are able to meet the growing demand in the US for wood products. 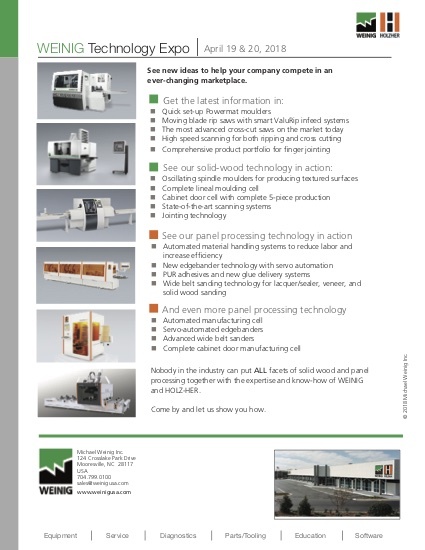 At the 2018 WEINIG/HOLZ-HER Technology Expo you’ll see the latest in advanced wood processing technology. Come see EnVision Software - allows you to order your products and send them immediately to the manufacturing floor all at once. Come see the WEINIG Service App - on display to show our new "smart factory" capabilities. Don't miss the chance to meet with our industry experts and learn how you can take your business to the level that will be required to keep up in 2018. 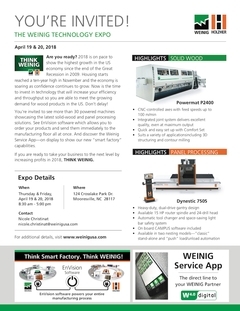 Pre-Register and attend the Weinig/Holz-Her Tech Expo and recieve a $500 credit voucher to be applied to any spare parts orders placed by April 30th. Conact Viking Machinery for more information!